Supporting fun and fitness at work in Houston, New Orleans, San Diego, and other major cities. As a corporate manager or executive, you are constantly looking for ways to maintain staff morale and sustain productivity. There are several different activities and programs you could invest in which would help your company to advance its cause, but few are more effective than corporate sports teams. Investing in corporate sports teams has a positive effect on your staff and your business as a whole. When you look at the different ways in which corporate sports teams have a positive effect on your business, it can build an urgency within your company to sponsor a sports team and reap all of the benefits. When the company sports team is playing, you can turn each game into an event for the entire company. It gives your staff a place to meet outside of the office, and that can help to solidify the bonds between staff members. It also gives the company an inexpensive way to add a positive part to the corporate culture that everyone can enjoy. While some of your employees are playing on the company sports team, the rest of the staff can cheer the team on. A corporate sponsored sports team turns into an event for the entire company. There is a natural competitive spirit in all athletes that makes them desperately want to compete with their teammates. The company sports team gives management a way to exert another level of discipline for employees that have experienced issues in the past. For example, the company could put office performance metrics on each sports team member and prevent those who do not meet their metric requirements from playing. It is the same concept that school sports teams use to encourage better academic performance in athletes. One of the best ways to encourage productivity in the workplace is to create a feeling of involvement for each employee. A sports team could be a great way to reach some of the employees that would normally not get involved in increasing productivity and generating more revenue. Being part of the company sports team will inspire staff members to take a bigger role in their daily job responsibilities and encourage increased productivity. 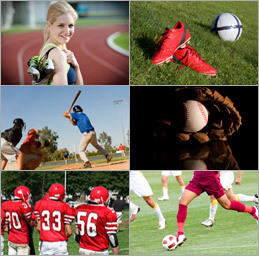 A corporate sports team needs players, equipment people, and coaches to be successful. When you sponsor a corporate sports team, you can open up involvement to a wide variety of staff members and encourage teamwork. Anyone who is involved with the corporate sports team at any level is going to feel like a part of the team. In sports, the significant energy of the moment helps to solidify that feeling of teamwork between everyone involved. That feeling of teamwork will find its way to the workplace and significantly benefit the company. A successful corporate sports team is something that employees and people in your industry talk about at sports bars and at public functions. When you have a successful corporate sports team, your company's name starts to circulate around your industry and that gives you valuable marketing exposure. When you are entertaining new potential clients, it can sometimes be difficult to get the conversation started in a positive and productive manner. That is why companies post pictures of their historic achievements and display other company accomplishments in the reception and meeting areas. These conversation starters do wonders for helping to break the initial tension of a business meeting and get things off to a strong start. A corporate sponsored sports team can add many new conversation starters to your reception and meeting areas, and help to break that tension early. When you display company sports trophies and pictures of successful company sports teams throughout your company, then you have established focal points that can help break the ice and make your sales meetings more effective. A successful company is able to generate a sense of pride among staff members that add prestige to the idea of working for the company. A corporate sports team can help to enhance that sense of pride and encourage employee retention. When a company gives its staff several different reasons to feel pride in working for that company, then those staff members are much less likely to look for employment elsewhere. The positive aspects of investing in a corporate sports team make it an investment that is well worth making. A corporate sponsored sports team becomes a gathering point and a source of pride for your staff. It is the kind of amenity that helps your company to stand out from other companies and helps your company to gain a competitive edge in the marketplace as well.